Technology firms are in the spotlight again Wednesday. Facebook (FB), King Digital Entertainment (KING) and International Game Technology (IGT) are all making waves for different reasons. Trading volume in Facebook shares could be higher than usual as investors react to the company's $2 billion acquisition of virtual reality firm Oculus VR. Facebook shares edged higher before the open. Shares in King, maker of the popular online game Candy Crush Saga, begin trading after its initial public offering on the New York Stock Exchange was priced at $22.50 a share, raising nearly $500 million and valuing the company at about $7.6 billion. King is one of 14 companies going public this week. International Game Technology shares fell in after-hours trading Tuesday after the company, which makes casino games, said it is planning to cut 7% of its staff and lowered its earnings guidance for the year. The stock has lost 18% so far this year. Tech stocks have been volatile this week. U.S. stock futures were relatively stable early Wednesday. U.S. stocks made gains Tuesday, breaking a two-day losing streak. The Dow Jones industrial average, S&P 500 and Nasdaq all edged higher, but by less than 1%. Investors were feeling optimistic after a new report showed consumer confidence reached its highest level in six years. There is little economic news on the docket Wednesday. The main economic release will come from the Census Bureau, which is reporting February data on durable goods orders at 8:30 a.m. ET. A consensus of economist opinion from Briefing.com shows a forecast of a 1% gain for February, compared to a decline of 1% the month before. 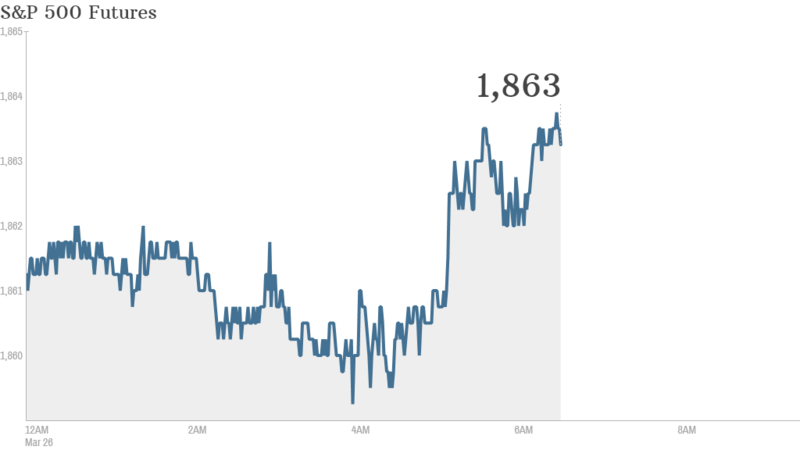 European markets were moving up in morning trading. The biggest gainer was the Dax in Germany, up by just over 1%. Most Asian markets gained ground Wednesday. The Hang Seng in Hong Kong climbed by 0.7%.